My year has been crazy- and it only seems to be getting crazier. I think that’s why when I spied Darryl Carter’s serene townhouse in November’s Elle Decor I was so instantly attracted to it. I typically love lots of bright colors, but right now I’m craving a home that is complete devoid of anything bold- cream, white, brown and black with color coming from art and flowers instead, allowing the beauty of a space and it’s antiques to be the spotlight. Oh yes, Monsieur Carter works the whole make-you-feel-serene look like few others. You always know a "Carter" space, it is so destinct…I could live in this, oh yes! Loving these spaces as well! They are so calming and I definitely tore out those pages from Elle Decor for my inspiration folder. Love them! I love this post – because I find neutral to be so soothing. 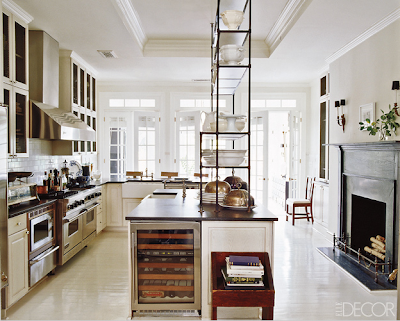 His kitchen is interesting – not sure if I could live with a 'shelf' on the kitchen counter. I have noticed more and more long kitchens – wonder why? Maybe it is because I have my eye open to them more, not because there are more out there. I just drooled over his home. i adore a neutral space. White/neutral rooms are my favorite. I think what gives them that extra depth and interest, however, is when natural wood pieces are brought in in contrasting tones – a dark armoire with light oak end tables… or a light wood kitchen table in an all-white kitchen with dark wood floors. Most of these rooms have that going on, and I love it. That's hilarious about the Cialis ad. I always ask my husband: what is up with the tubs outside in these ads?! Those stone medallions at the ends of the tubs scare me a little – potential toe squishers. Gorgeous house, though. That black wingchair is the bomb. Damela por favor. I love my neutral great room. I find rooms with little color to be very calming after a long day. I did a similar post last week on adding bits of color to neutral spaces. Oh my, so lovely. So peaceful. So well edited. Thanks for sharing such a beautiful post with us. I am going to go back and look again more slowly. I too fell in love with Darryl Carter's DC home when I read the article. Loved the other spaces you posted as well. Great post. did i spy a fireplace in the kitchen?! These rooms are all neutral without being boring. I love the tulip chairs combined with the farmhouse table! That speaks to me! i want an all white house – with beat up old wood floors and for my books and photosto be my splashes of color. i am so ready to start over. Yes, I couldn’t agree more, the neutrals are soo soothing! the 9th picture!!! that is the kind of table i have been trying to find!!!! And I love those floors!!!! DO you know where to get the table!? Have a great day! Наш нужный интернет-сайт , он рассказывает про ремонт в квартире киев.